RECON Smoke Odor Sealer encapsulates malodors on structural surfaces and blocks the toughest stains, typically found on fire damage restoration projects. Unlike typical water based coatings that “wick” smoke odors and stains out of the substrate as they dry, RECON Smoke Odor Sealer with OdorLock technology prevents smoke odors and stains from migrating through the coating while maintaining its breathability. Get one-coat odor control and continue to block odors even with seasonal changes in temperature and humidity when you use RECON Smoke Odor Sealer as your final step to encapsulate residual odors. 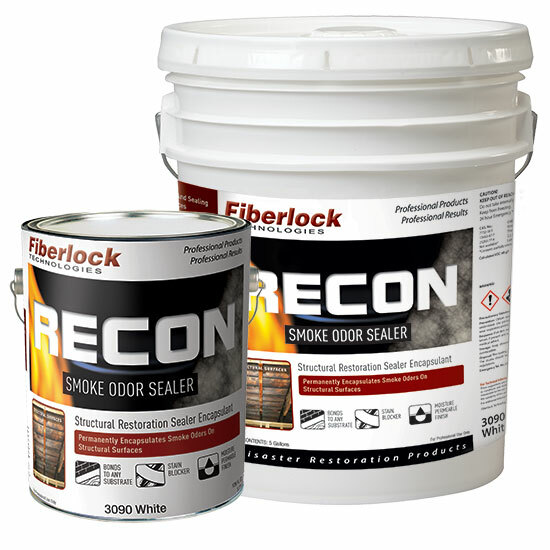 Prior to applying Fiberlock’s RECON Smoke Odor Sealer it is critical that the substrate be thoroughly cleaned. Smoke odor encapsulation is a final step that needs to be part of a comprehensive smoke/odor management protocol. This protocol should include the following steps: odor cleaning, odor neutralization and odor encapsulation. Fiberlock recommends cleaning with RECON Heavy Duty Cleaner or Extreme Duty Cleaner, followed by the application of RECON Extreme Duty Odor Counteractant. After the substrate is clean, dry and sound apply RECON Smoke Odor Sealer to encapsulate any residual odors that remain. Apply RECON Smoke Odor Sealer with a brush or airless spray equipment. Apply RECON Smoke Odor Sealer generously and uniformly by brush or airless spray. Roller application is not recommended. Apply one coat of RECON Smoke Odor Sealer and ensure that the finished surface is properly sealed. To ensure that the finished surface is properly sealed, two-coats may be required on some porous or heavily stained surfaces. Topcoat floor applications when foot traffic or heavy storage is expected. RECON Smoke Odor Sealer is tintable up to 2 oz. of universal liquid colorant per gallon. HVAC Application: RECON Smoke Odor Sealer can be used to encapsulate malodors within HVAC systems as part of fire damage restoration. This product can be used in both fiberglass lined and unlined ductwork. Surfaces should be clean, dry and sound prior to application. RECON Smoke and Odor Sealer meets requirements of NFPA 90A/90B standard. Wait at least 24 hours prior to topcoating @ 70 – 77°F, 50% R.H. Lightly sand and clean surface of Recon Smoke Odor Sealer prior to topcoating. Do not topcoat Recon Smoke Odor Sealer with anything less than a quality 100% acrylic latex coating with an eggshell sheen or higher. Avoid enamel, alkyd and oil based paint topcoats. Test patch prior to application is recommended. Failure to follow these guidelines could result in cracking or “alligatoring” on certain substrates.